Until the dueling memos were filed last week, the sentencing hearing for Flynn — who pleaded guilty to lying about conversations during the transition period with the then-Russian ambassador — was expected to be devoid of the drama characterizing other of Mueller's cases. Mueller's team has rejected any suggestion that Flynn was duped, with prosecutors responding in a sentencing memo Friday that there was no obligation to warn Flynn against lying. 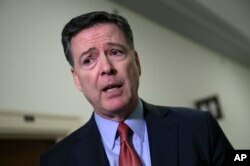 Former FBI Director James Comey speaks to reporters on Capitol Hill, Dec. 17, 2018, after a second closed-door interview with two Republican-led committees investigating what they say was bias at the Justice Department before the 2016 presidential election, Dec. 17, 2018. It's possible at least some of the defense arguments may resonate with U.S. District Judge Emmet Sullivan, who directed prosecutors to produce FBI records related to Flynn's interview. That included portions of the notes from Flynn's Jan. 24, 2017 interview with FBI agents. Responding to Sullivan's order, prosecutors filed a redacted copy of the FBI interview notes Monday evening. The notes show FBI agents interviewed Flynn about his Russian contacts, including past trips to the country and his conversations with Sergey Kislyak, then Russia's ambassador to the U.S. The notes show Flynn told agents he didn't ask Kislyak not to escalate Russia's response to sanctions imposed by the Obama administration over election interference. But Flynn admitted as part of his guilty plea that he did. 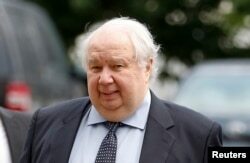 FILE - Russian Ambassador to the U.S. Sergei Kislyak arrives at the State Department in Washington, July 17, 2017. The notes also show Flynn told agents he didn't ask Kislyak to see if Russia would vote a certain way on a United Nations resolution involving Israeli settlements. But last year he admitted having asked Kislyak to see if Russia would vote against or delay the resolution. Court papers show Flynn made the request at the direction of Trump son-in-law Jared Kushner. In an opinion piece for The Wall Street Journal last year, Sullivan said the experience inspired him to explicitly remind prosecutors in every criminal case before him of their obligation to provide defendants with favorable evidence. He says he has encouraged colleagues to do the same.